Add magic and ambience to your home this holiday season with the EcoSmart 50-Light C6 LED Warm White String Light Set. Each 16 ft. strand features 50 C6-shaped bulbs placed 4 in. apart to create a dazzling display. Connect up to 36 sets (sold separately) indoors or outdoors for convenient, one-plug decorating. This light set also features long-lasting, flicker-free lighting to provide a consistent glow. Continuous-on technology keeps the string lit even if a bulb burns out or becomes to keep your seasonal scene largely intact. The super-efficient LED bulbs use up to 80% less energy than traditional incandescent bulbs, to help keep electricity costs minimized. And with weather-resistant sealed sockets, you can feel confident that your light display will stand strong throughout the holiday season. Wherever you decide to place these high-quality C6 lights, you can be sure they will light up any space in a big way! Add instant holiday dicor with projection lighting featuring ribbons of vibrant light in red, green, blue and white. Manage 15 color combinations with the included remote control. Creates magical holiday lighting on indoor or outdoor surfaces, including exterior or interior walls, living spaces, front doors and porches, garage doors, fences, trees and shrubs. Update your holiday decorations quickly and easily with beautiful LED projection lighting. Brighten any holiday scene with this starry projection of light. Featuring 15 brilliant color options, LightShow Projection Star of Bethlehem creates magical holiday lighting on indoor or outdoor surfaces, including exterior or interior walls, living spaces, front doors and porches, garage doors, fences, trees and shrubs. Update your holiday decorations quickly and easily with beautiful LED projection lighting. 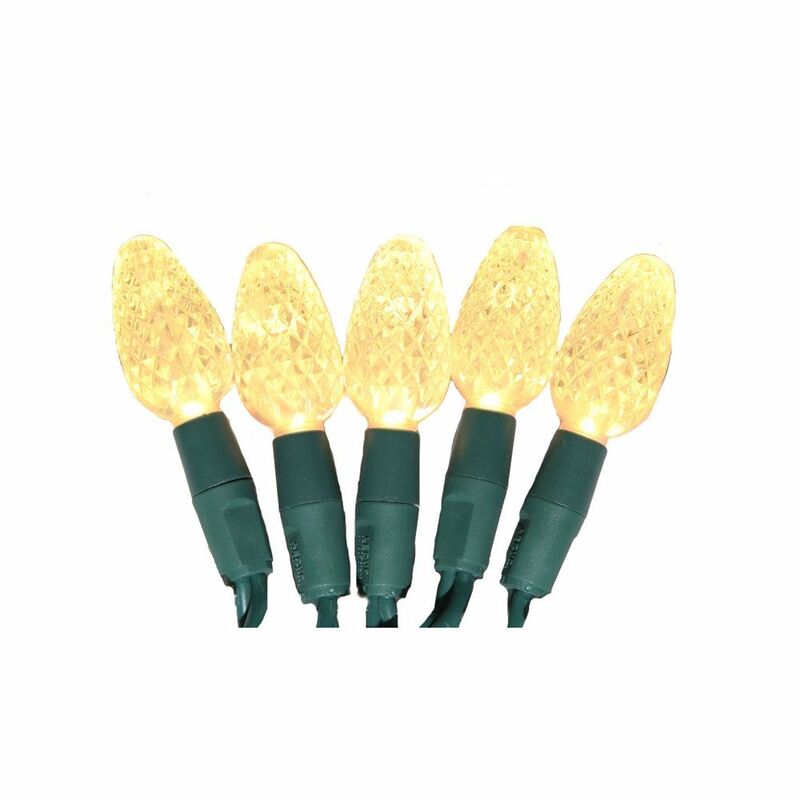 50-Light Warm White LED C6 Christmas Lights Add magic and ambience to your home this holiday season with the EcoSmart 50-Light C6 LED Warm White String Light Set. Each 16 ft. strand features 50 C6-shaped bulbs placed 4 in. apart to create a dazzling display. Connect up to 36 sets (sold separately) indoors or outdoors for convenient, one-plug decorating. This light set also features long-lasting, flicker-free lighting to provide a consistent glow. Continuous-on technology keeps the string lit even if a bulb burns out or becomes to keep your seasonal scene largely intact. The super-efficient LED bulbs use up to 80% less energy than traditional incandescent bulbs, to help keep electricity costs minimized. And with weather-resistant sealed sockets, you can feel confident that your light display will stand strong throughout the holiday season. Wherever you decide to place these high-quality C6 lights, you can be sure they will light up any space in a big way!